Aloe Vera has so many beneficial properties! From cuts and burns to cold sores, and even high temperatures, it seems there is no end to what this plant can do for your skin. But, it’s also a great treatment for those experiencing a dry scalp. There are many different components and ‘ingredients’ that make it the perfect solution. But, the best part? It allows you to experience almost instant, cooling relief. When you have a dry scalp, that can feel like the most important thing to deal with first. Dry scalp can happen for a variety of different reasons. Whether you are prone to dry skin, experiencing a lot of cold weather, or have damaged hair, aloe vera can help. Not only can it reduce irritation and itching, but it can help to prevent large flakes or dandruff. No one wants to have to deal with the embarrassment that goes along with that. No matter what may cause your dry scalp, aloe vera has the right resources to treat it. Some, you may already know, while others might just surprise you. So, let’s look at why we love aloe vera – and why you should, too! If you experience dryness on a regular basis, these facts could make you an aloe vera convert immediately. 10. A Healthy, Happy Scalp – And Hair! Aloe vera contains 75 different components within its overall structure. From minerals and enzymes like zinc to sugars, and yes – even vitamins. It contains a few vital, nutrient-dense vitamins that can not only benefit your whole body but of course, your scalp. Often, dry skin is caused by a Vitamin A deficiency. Vitamin A can help the skin on your scalp to retain its natural moisture and work ‘overtime’ to lock that moisture in. Because aloe is made up of so much water, keeping that moisture ‘trapped’ in the skin cells can work to hydrate the scalp. The good news is that Vitamin A is one of the most easily absorbed vitamins to penetrate into the skin. Its natural occurrence in aloe vera will help to capture the moisture your hair and scalp needs. Vitamin C helps to promote faster healing, which can make an impact on a dry, irritated scalp that’s causing discomfort. It helps to restructure the collagen in your skin, making it more resilient. If your scalp is itchy and inflamed, this vitamin found in aloe is a great way to soothe it. Not only does Vitamin E help your immune system, which can fight back against dry skin, but it keeps vessels healthy. When it comes to a dry scalp, Vitamin E uses antioxidant properties to heal, repair, and moisturize. A body that is deficient in Vitamin B is more likely to experience dry, irritated skin. Vitamin B1, B2, B3, and B6 are present in aloe vera. This helps to improve the overall moisture retention of the scalp. Vitamin B mostly benefits the outermost layer of the skin, where you’ll feel the most irritation and itching. Our bodies need amino acids to function properly. Most of these amino acids, we naturally produce on our own. Others, we typically get through the food we eat and the nourishment we provide our bodies. Amino acids build strong, healing proteins within the body that are necessary to live a healthy life. They are found in our cells, basic tissue, and even our muscles. They allow our body to do the most basic of functions from within. From structuring cells to carrying out natural bodily actions, we couldn’t even breathe without the necessary amino acids. Aloe vera contains 20 of the 22 required amino acids a person needs on a constant basis. Our of these amino acids we need, eight of them are considered to be ‘essential,’ and Aloe Vera once again shows off. It holds seven of those eight essential amino acids. Think of them as the basic building blocks of amino acids. They are a structure to build all of our additional bodily functions. Since we need these protein-building blocks to function, imagine how powerful a treatment option something that holds almost all of them can be. Simply put, aloe vera itself is extremely good for your skin! Even with all of it’s incredible, complex healing properties, aloe vera is made up of 99% water. That provides an incredible amount of moisture and hydration with each use. It also helps to give extra oxygen to your skin cells, which can be complicated with other treatments for dry scalp. This oxygen delivery allows those skin cells to strengthen, and improve overall blood flow to heal faster. Aloe is also extremely soothing. Nothing feels better than placing a bit of aloe vera directly on an inflamed dry scalp. One of the biggest reasons we itch is because there is plenty of irritation. When that irritation goes away, the itching can subside. So, you won’t have to worry about embarrassing flakes or dandruff. Thanks to its long list of ingredients, aloe vera increases the elasticity of your skin. This is typically used to achieve ‘younger-looking’ skin on other areas of your body. But, when it comes to a dry scalp, more elastic skin is stronger and more resistant and resilient. That can help to fight back against dryness and irritation. If you’re using aloe vera elsewhere on your body, don’t ignore its practical healing benefits when it comes to the skin on your scalp. It’s easy to ignore what’s ‘under our hair,’ but when the skin there is irritated, it can be treated like skin anywhere else. We tend to think of antibacterial products as a way to fight off infection, and aloe vera is no different. But, what does an infection have to do with dry scalp? Well, just about everything if your scalp is inflamed, itchy, and irritated. By scratching at it, you run the risk of cutting yourself, opening up a small wound, and yes, even getting an infection. Aloe helps to fight against possible infections by healing the skin and prohibiting the growth of harmful bacteria that could cause even more problems. The antibacterial properties also act as a natural anti-inflammatory. So, if you are feeling any pain or irritation, the antibacterial components of aloe vera can provide relief. It helps to remove excess dead tissue from your scalp – not to be confused with dry, flaking skin. Once the dead tissue is out of the way, new, healthy skin can come forward. This new skin will be stronger, reducing the chances of infection, and lessening any possible irritation. Consider any minor cuts from scratching your scalp as you would any other cut on the body, and treat it with the antibacterial properties it needs to prevent infection and harmful bacteria growth. Along with having antibacterial properties, aloe vera is also an antiseptic. Thanks to salicylic acid as one of the leading components, it’s antiseptic properties promote healing and growth of healthy skin. Antiseptics also work in tandem with antibacterial properties to keep away harmful bacteria and infection. 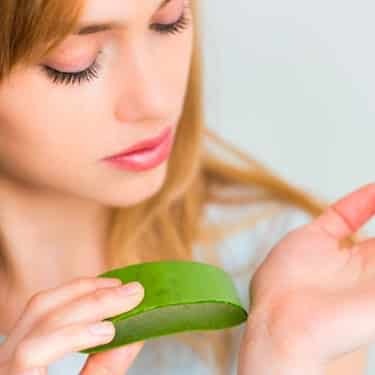 Essentially, you can think of the antiseptic properties of aloe vera as a way to keep things ‘clean.’ When applied topically to your scalp, these properties act as a line of defense against harmful organisms. The antiseptic properties also go beneath the top layer of the skin, to start healing from within. Not only does this help reduce inflammation and pain, but can help to alleviate itching. Both the antibacterial and antiseptic properties of aloe vera work side by side. This helps to ensure the right kind of healing, new skin growth, and a reduced chance for any other issues to pop up because of a dry scalp. Aloe vera is a natural immune system booster, and that’s thanks in part to these antiseptic properties. Whether you choose to apply it topically, or take a supplement, boosting your immune system can start the healing process from the inside out. The antiseptic nature of the plant itself is what takes control of that process. It ensures infection won’t get in the way of a healthy scalp. You might not initially think of hair health as a connection with a dry scalp, but it’s all connected. Your hair has a certain pH level, and it should always be somewhere between 4.5 and 5.5. Well, some of the biggest symptoms of your hair’s pH being ‘off’ are dry scalp, itchy scalp, and flaking or dandruff. Aloe vera as a gel, or topical agent, has the perfect pH level. It falls within that 4.5 to 5.5 range that your hair is naturally supposed to have. So, if your pH balance is out of whack, and you have a dry scalp because of it, aloe vera can help to balance it again. The best way to quickly get to the source, and start treatment, is to use a shampoo containing aloe as the main ingredient. It could be your traditional shampoo, conditioner, or another hair product that’s drying out your scalp by changing the pH level of your hair. Chemically-based products can strip your hair of the nutrients it needs, and affect the scalp more than you might think. So, try switching out your chemically-based shampoo for a natural aloe vera shampoo. Or, follow up your routine with a natural aloe vera rinse. Keep in mind that there are other products out there meant to bring up your pH levels. However, these can be harmful, or damaging. Aloe shampoos and oils aren’t like other high pH hair products since they are completely natural. They won’t strip your hair and scalp or cause damage with too much pH. Instead, they will give you the perfect necessary amount for a healthy scalp. If it’s the pH balance of your hair that is drying out your scalp, aloe can get it back to where it needs to be. Pectin is typically found in jellies and jams as a thickening agent. It’s what holds the ingredients together, and keeps the jam from getting too runny. It holds things together and makes them stronger. Well, strange as it may sound, you can think of it as an aspect of aloe vera in the same way. Pectin doesn’t just keep things from becoming too ‘loose.’ It works as a sort of glue or cement for the cells of your skin. When it comes to your scalp, strengthening these cells allows them to grow. Eventually, they grow big enough and strong enough, to divide. This division creates new, healthy cells that end up replacing damaged or dead skin cells. The healthy cells will then promote healing of an inflamed, dry scalp. They will also help to retain moisture. That makes it more difficult for the effects of dry scalp to keep coming back – especially if you continue to use aloe vera products. The pectin in aloe vera is also a key ingredient in battling dandruff. Using an aloe shampoo will allow the pectin to work its magic in your hair really, and on your scalp, as it can penetrate the skin at the source. Once those healthy cells start to take over, you may notice a bit of flaking from the dead skin clearing away at first, but it will put a stop to dandruff entirely once that skin is gone, and the healthy cells have cleared things up. If you’re looking for a way to strengthen and protect your skin cells, pectin is the way to go. It is a central and incredibly powerful ingredient within the aloe plant. Inflammation might be irritating, and even painful at times. But it’s necessary for your body to heal. So, don’t be too put off by a little bit of discomfort. It is nothing more than an increase in blood flow to the affected/injured area, so your immune system can work overtime to fix the problem. Your body wants to reject the effects of a dry scalp naturally, so the inflammation that occurs is just the immediate reaction toward fixing it. Aloe has an active ingredient called Campesterol, which helps to decrease inflammation by generating new skin cells. These cells serve as ‘extra workers’ on the job, healing the inflamed area faster. Inflammation may not be the cause of your dry, itchy scalp, but it can be the result of one. Once the itching starts, you can expect flaking, dandruff, and perhaps even small cuts and sores. The other active ingredient in aloe vera that helps to reduce inflammation is called Bradykinin. This works by increasing the overall blood flow within the body. That increased blood flow causes blood vessels to enlarge, and the more active blood flow is going toward the inflamed area, the quicker it will start to heal. If you use an aloe vera product directly on your scalp, that’s where those enlarged cells will start to work first. Once the redness of the inflamed area goes down, so will the itching and scratching. 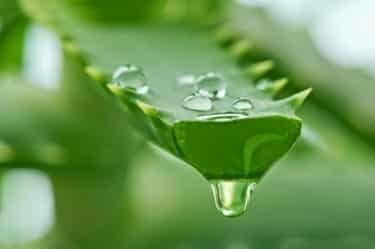 Not only does aloe vera help to heal and eventually stop inflammation from occurring, but it has a more ‘instant’ benefit as well: It soothes the inflammation. Aloe has natural cooling properties. When applied topically, directly to the skin, you’ll notice the cooling sensation practically right away, which can make an irritated, inflamed scalp feel much better. That can make it easier to stop itching and scratching, which will also provide more relief. It will also lessen the risk of causing more irritation through that same itching and scratching. We’ve already touched on how aloe vera’s antiseptic and antibacterial properties can help to heal the skin of your scalp. But, one of the biggest issues that go along with dry scalp isn’t always irritation and inflammation. Many people find the most bothersome aspect of a dry scalp to be flaking and dandruff. Inflammation and even discomfort can be something you deal with personally. But when you have itching that causes flaking skin, or dandruff, you’re letting the world see. It’s almost impossible to hide if you’re dealing with it. That’s where the antifungal properties of aloe vera step in. Dandruff can sometimes be caused by a fungus, rather than actual dry skin. By massaging an aloe gel into your hair and scalp for about thirty minutes, and then shampooing normally, you can fight back against that fungus, and in turn, dandruff. If you’ve tried everything else to fight back against flaking skin, the antifungal nature of aloe vera could be the answer. It will also help the fungus from spreading elsewhere or getting worse. Of course, it’s hard to think about the health of your scalp without automatically thinking about your hair. There are hundreds of reasons to love aloe vera in general, but when it comes to a dry scalp and healthy hair, the possibilities still seem endless! From rich vitamins and minerals to necessary proteins, and ultimate hydration, it will help to give you sleek, shiny, and healthy hair. It cleans the pores of your scalp, promotes healthy hair growth, and smooths down your locks. If you start to use aloe vera in your daily hair care routine, you’re bound to notice a difference. Not only in the way your hair looks and feels, but how your scalp feels. Traditional shampoos and hair products can contain harsh chemicals that can do more damage than good. Not only is aloe a natural ingredient, but because it has so many healing properties, you’re helping your scalp every time you wash your hair with an aloe shampoo. There are also plenty of natural aloe vera oils you can use to achieve the same effect. As you can see, there are plenty of benefits to using aloe vera for a dry scalp. Not only is it a natural ingredient you can depend on to work the same way every time, but it is 100% safe. Everyone experiences dry scalp for different reasons, but even if it’s weather, lifestyle choices, or a genetic proneness to dry skin, there is always a way to fight back against it. Whether you have a dry scalp or not, aloe vera is a healthy choice for your skin, hair, and scalp. Try looking for products with aloe as one of the top ingredients, and ones that are only made with natural ingredients. When you replace your chemical-based products with aloe vera-based products, you’re helping yourself, your skin, and even the environment. There are so many reasons to love aloe vera when it comes to having a dry scalp. Use these reasons as your resource if you’re struggling with an itchy, flaky head. Introducing aloe into your life can clear up those problems, and give you the healthy scalp and hair you deserve.